In August, Peggy will perform with Sonic Calligraphy a one set program of Chinese folksongs, poetry, originals and jazz standards at Cornelia Street Cafe. Special guest NY trombonist Chris Washburne will join her and Swiss pianist, Adrian Frey. In February, the duo collaborated on a special presentation of their music with the San Francisco based theater group "Eth-Noh-Tec" (Nancy Wang and Robert Kikuchi-Yngojo) and their play "Red Altar." The duo also made an appearance at the Maybeck Studio in Berkeley. In March, they performed with NY violinist Jason Kao Hwang and special surprise guest, legendary vocalist Jay Clayton sat in with the group. 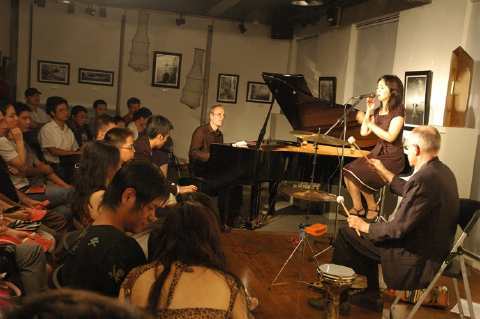 In January, Sonic Calligraphy duo with Peggy Chew, vocals and Adrian Frey, piano toured Hong Kong, China, and New York. In Hong Kong, they performed at the poetry retrospective of Hong Kong poet, Leung Ping-kwan (Yasi). In Guangzhou, they collaborated with choreographer and dance performance artist, Er Gao and his dance company. In Shenzhen, they played a duo concert. In February, NY trombonist Chris Washburne joined the Sonic Calligraphy duo at Ibeam, Brooklyn, NY. In the spring of 2013, Sonic Calligraphy featured Swiss guitarist Felix Utzinger with his grooves and wide palette of electronic sounds to the group's music. They played a series of concerts throughout Switzerland. In October 2012, Sonic Calligraphy toured throughout China with various Chinese guests in Beijing, Shanghai, Guangzhou, Qingdao, Changsha, and Shenzhen. The guests included their former musical collaborators: Coco Zhao, jazz singer from Shanghai and Wu Na, gu qin master from Beijing as well as these great musicians: Li Tie Qiao , alto saxophonist from Beijing, Song Zhao, celloist from Beijing, and Er Gao, dancer from Guangzhou. As participants of Pro Helvetia, the Swiss Arts Foundation's "Swiss Chinese Cultural Explorations" program, Sonic Calligraphy toured with their Chinese guest musicians throughout Switzerland. The group was also featured in the Culturescapes Festival. They also released their new CD "The Flow of Things" on the Swiss label altrisuoni. Sonic Calligraphy was selected by Pro Helvetia to create a cultural exchange with Chinese musicians. This fall tour took them to Shanghai, Hangzhou, Beijing, Qingdao, Guangzhou, Shenzhen, and Hong Kong.